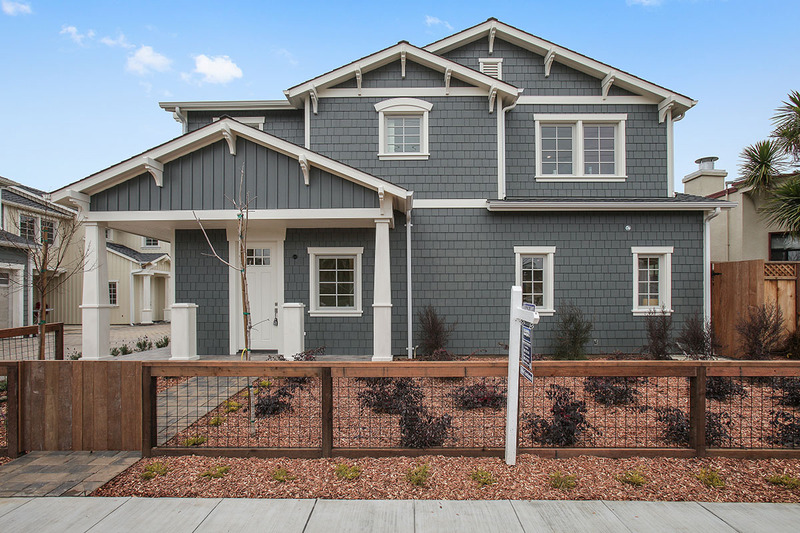 Rarely does an opportunity such as this become available in downtown San Mateo – luxurious new townhome living just two blocks to shopping, dining, theaters, and CalTrain. Renowned Hillsborough builder, Thorenfeldt Construction, has just completed 8 two-story homes, each boasting a modern interpretation of Craftsman architecture. Distinctive features finish every home, including grey-hued hardwood flooring in every room, crisp white millwork, gorgeous tile selections, and smart home wiring. Each unit has an open concept living area arrangement on the main level. The large, well-equipped gourmet kitchens have quality stainless steel appliances, breakfast bar seating, and French door to a private patio ideal for a barbecue. Upstairs, two spacious bedrooms each have an en suite bath beautifully finished in quartz and tile and one plan also has added den/office area. Throughout, LED lighting adds energy efficiency and divided pane windows provide abundant natural light and sound protection. Rounding out the appeal is the convenience of an attached one-car garage with direct access plus a one-car carport. Whether downsizing from a larger home, moving up, or just starting out, this is a wonderful place to call home in downtown San Mateo.